Has your child or even yourself been taken over by Minecraft? Well mine has and every little merchandise that comes out he is over the moon about. 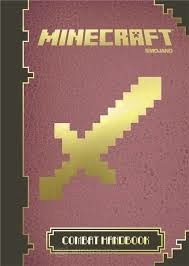 One of the latest things is the Minecraft books full of tips, instructions and alot of stuff to help aid the game. My son has all the collection and he has built massive roller coasters and castles with a little inspiration from the game. So here is your chance to win your very own copy of the Combat edition of the book series RRP £7.99. Full of tips to help you defend yourself against the monsters and other players. Also includes how to build traps, build forts and how to battle your way out of one on one combat. You can enter using the Rafflecopter below. Houses, Boats, It is cute! My boys build shipping ports and airports and my girls build houses! Do you know what I don't know - but they do like Steve - does that count? My son has been working on his duck house in the sky! I think my grandson builds forts more than anything. My son built a zoo hotel! my little brother builds such amazing things half the time i have no idea what they are but just looking at them they are beautiful! My son likes building whole towns. My 11 year old son is obsessed, he is always building things, I've no idea what though! Our daughter has recently built a library and a hospital apparently! Grandson loves Minecraft and is always building and demolishing things. I can never work out exactly what they are - but they look very complicated. He's very generous and is always giving things away as well. My 6 year old granddaughter loves it ,am not sure what she builds but loves it! My daughter loves building houses. Melody (4) says houses, her friend Dylan (9) says nothing, he likes blowing stuff up!!! My son is Minecraft mad his world is fab :) he loves building farm houses & castles. Huge pyramids with lots of rooms inside to hide in. Mountains like in Lord of the Rings!